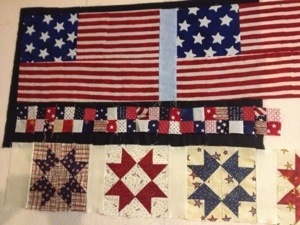 A while back I had some blocks that I needed to put together into a quilt top. I decided to use scraps for the sashings and borders. I like the way it came out. I’ve had these rows on the design wall now for several weeks. 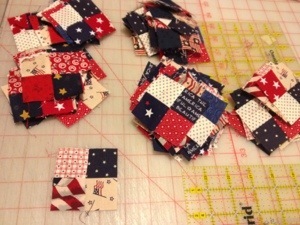 (I don’t spend much time piecing) anyway, now I’ve decided that I’m going to use scraps to make the quilt bigger. 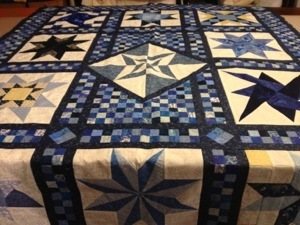 The rows were exchanged at my guild and each one is about 42 inches wide. I am going to make a frame around each row so that all the rows are the same exact length. Then I will use 4 patches to make a row between each row. Here’s the idea. 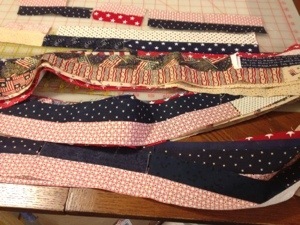 I got in my scraps and cut lots of 1 1/2″ strips. I use whatever size strips I have. I then sewed them into sets. 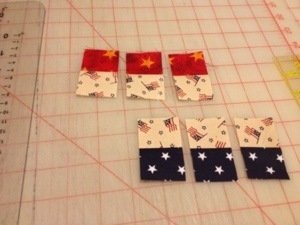 Then I cut them into 11/2′ pieces and make into 4 patches.